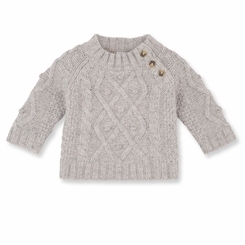 Made in a wool and nylon knit, this baby boy's sweater features cabling and decorative stitches. This practical sweater has an opening along the sleeve that makes it easy to slip over baby's head. A perfect sweater for winter.